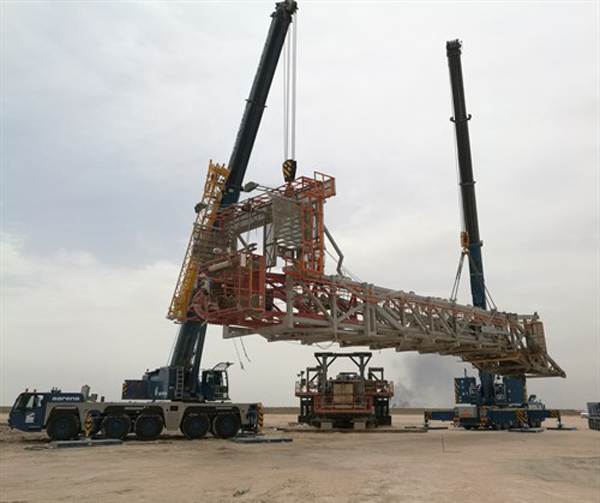 Sarens has used trailers and mobile cranes to move and install an oil rig at the North Rumaila oil field in southern Iraq. Sarens performed the operation on behalf of Rumaila Operating Organization and BP Iraq. This giant oil field contains an estimated 17bn barrels of oil, 12% of the country's reserves. The oil rig had a 93t mast measuring 32m x 3.6m x 7m, as well as a 147t bottom structure measuring 22m x 9m x 6m. In order to transport the rig, Sarens used a a mix of traditional trailers and K-25 SPMTs. A 250t and a 120t mobile crane alongside a climbing jack system were used to lift the rig. "This is the first rig move in Rumaila Oil Field via SPMT," says branch manager and technical solutions manager Shwan Askari. "Sarens transported the total substructure about 5km, saving time and money. The entire operation was carried out safely."